Plumbing a reef tank is something that might sound harder than it is. Even if you’ve never done much DIY work before, you can do this. Here is what to know about how to measure, cut and glue your plumbing. Some basic info about what materials to select is in here as well. The most common choice for plumbing is PVC – a time-tested material that is both cheap and easy to find at hardware stores in various sizes. For overflow standpipes, rigid tubing should be used. Other than that, flexible tubing can be used throughout. 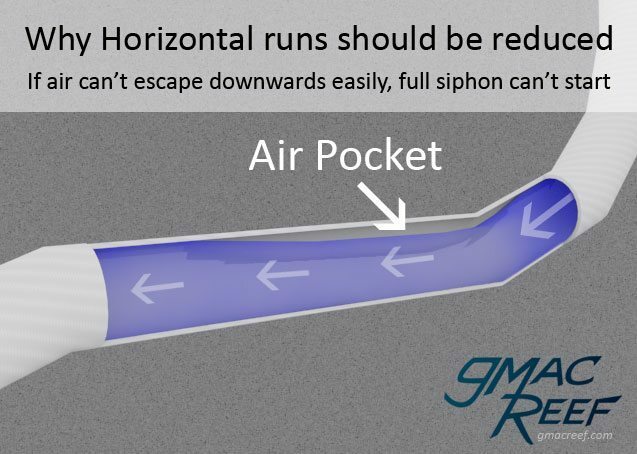 Flex tubing will lessen any horizontal runs, which is beneficial for siphon based overflow methods like the Herbie Overflow. 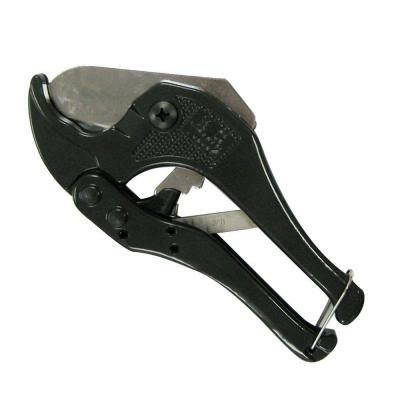 The easiest way to cut all types of PVC and other tubing is with a ratcheting PVC cutter. This handheld tool is quick and results in nice, square cuts with no dust up to about 1-1/4″ pipe. For larger diameters, wood saws such as a miter saw must be used. A normal wood cutting blade does the job. Be aware of where the blade is oriented and where it will shoot the dust. Be sure to wear eye protection because of the plastic dust or shrapnel. A full-face shield is better. Care should be taken when cutting pipe with any kind of power tool. Supporting the piece can be a challenge so get a helper to hold as well while you make your cut. Remove any burrs before you glue anything. 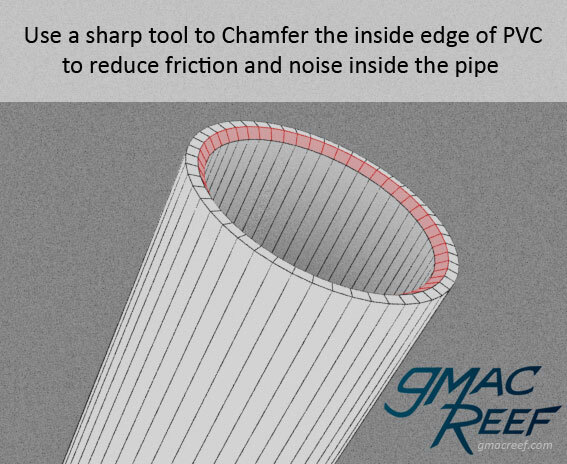 Plumbing Tip: For rigid sections of PVC (not spa-flex) you can use a chisel or other sharp tool to slightly chamfer the inside edges of each section. This will make the system run quieter because water is less likely to roll inside the plumbing and create noise. Going with “Measure twice, cut once” you should assemble your plumbing before doing any gluing. This will reduce do-overs and trips back to the store. It’s also helpful to mark the orientation of the fittings with a Sharpie so they line up at the proper angle when you glue them. While fittings are supposed to be universal, you will find small differences in pieces from different manufacturers. Gluing should ideally be done in a well-ventilated area over a drop cloth of some kind. The term “Gluing” is used only to describe the process, as you are really using a solvent cement to chemically bond the two pieces of PVC together. The bond that is created is completely permanent, and pieces will have to be cut or sawn apart. 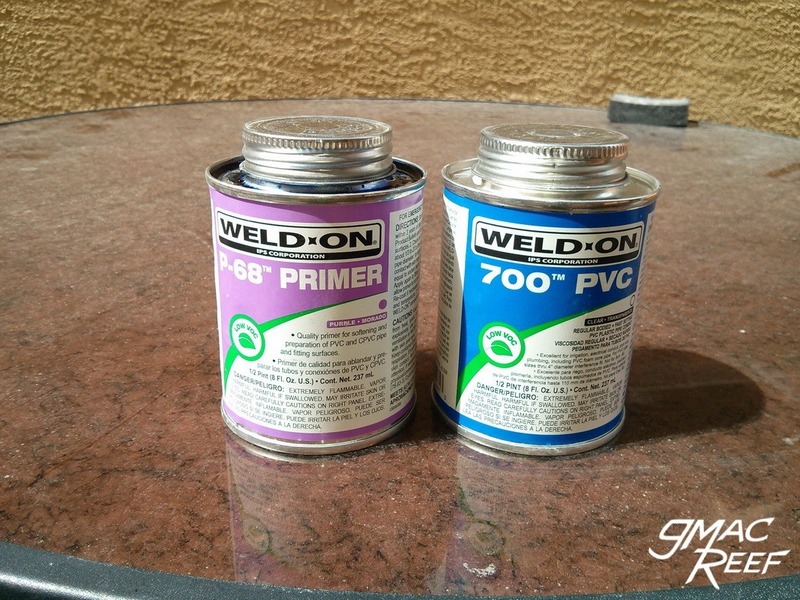 Primer is almost always purple in color and should be used to prepare the surfaces that will receive the PVC cement. There are some people that say that using primer isn’t generally needed with brand new pipe, and that it’s made to help out plumbers in a hurry who might not be able to fully clean off a pipe fitting. 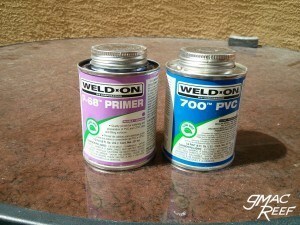 This may be some truth to this, but using primer will arguably result in the best possible bond.There are areas of the USA that require the use of primer as part of building code for PVC connections. This should give some idea of it’s importance. For the cement, there are clear types but the most common variety is dark gray in color. An advantage of the dark gray glue solvent is that it makes it easier to visually confirm you’ve applied it to the pieces completely before assembly. 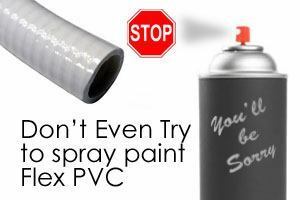 One of the most important things to make sure of is that your PVC primer and solvent is not expired. It should have an expiration date on the can somewhere, often on the underside. What type of Bulkheads should I use? These are a good choice for the Herbie System. 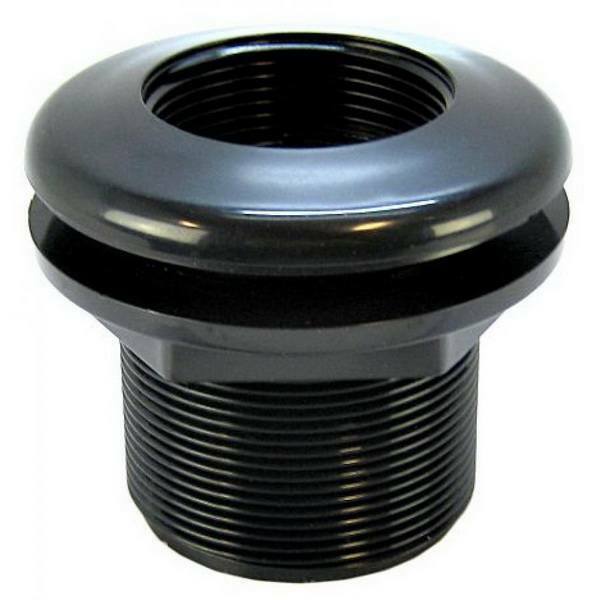 Threaded fittings (like standpipes) can be installed in the tank to the flange side of the bulkhead, and the outside end glues to a piece of PVC for a secure, permanent connection. These fittings are self explanatory but there are some things to be aware of. You should not use Teflon tape as it is intended for metal. Using it with PVC will usually result in an inferior seal. Threads can vary by manufacturer and also by Schedule (ex. 40 vs. 80). Threaded fitting like unions generally should be tightened to finger-tight, then 1 to 2 turns more. This can generally be done without any tools. You should not use any kind of glue or paste. 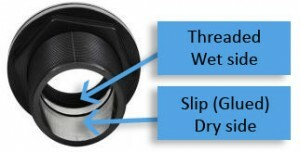 The only suitable thing to use on the threads is non-hardening thread sealant. Most people don’t use anything. With the proper bit, this is quite easy to do. Take your time, make sure the bit is lubricated with water, and let the bit do the work, not the pressure of the drill. This video shows the basic process but you really shouldn’t rush drilling for a few reasons. Bulkheads come ready to install and don’t require any extra glue, etc. but some people add a lubricant to the rubber gasket. This generally isn’t needed. 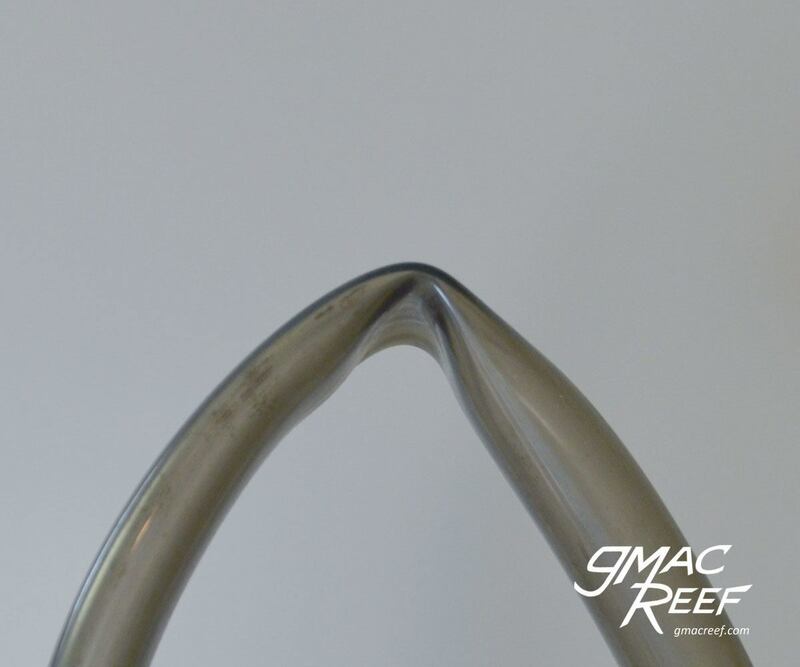 The only type suitable is a silicone based type – Never use any kind of petroleum based oil on the gasket. How to Install: The gasket should be placed between the flange and the glass on the inside of the tank. You generally want to tighten the Nut to the point of contact, then go 3/4 of a turn past that point using a wrench if possible. Do not over-tighten, because the glass will crack. Once tight, it may be possible to spin the Bulkhead in the hole by forcing it, even though the seal is intact. It is important to understand that when you drill holes in a piece of glass, the holes become a point where force concentrates. The places where holes are drilled in a pane of glass, even with bulkheads installed, can become an Achilles’ Heel of the tank. This just means that you should be careful with your tank, especially around the bulkheads. 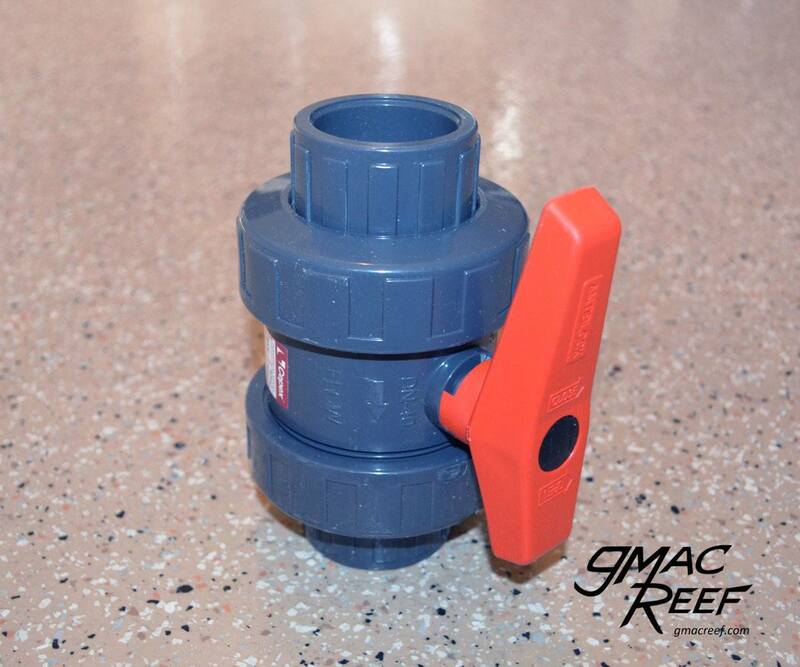 When we install standpipes and lengths of PVC to the bulkheads, they can act as levers. Levers that have the potential to place strong lateral forces on the glass if pressure is applied. Enough force, and a crack can happen. This is unfortunately more common than you might think in the hobby. Never allow the tank to rest with any part of its weight on a Bulkhead such as during moving. Remove the bulkheads first or support the tank otherwise. Take care not to pull, bump or place any force on the standpipes in an overflow for example. These forces are also why adding bulkheads to any tank with glass thickness less than 6mm (1/4″) is a bad idea. Anything thinner simply does not have enough strength to stand up to normal amounts of force. Most (if not all) Bulkheads you will find are made from black ABS, not PVC. It is generally not advisable to join ABS to PVC using regular PVC cement, but I have done so many times. Never had a problem. 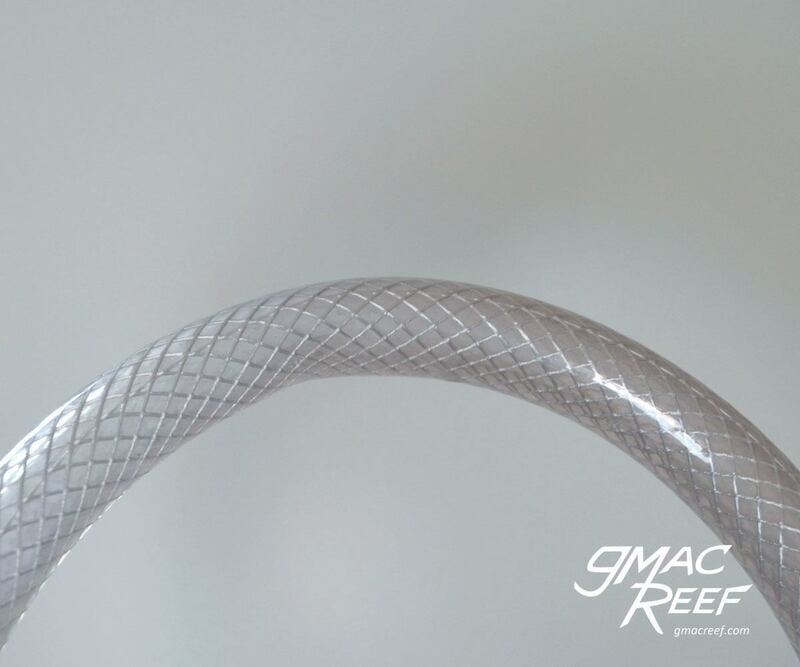 There is a special cement for PVC to ABS connections that you can find if you are concerned. On the dry side of the bulkhead, you may want to glue a short length of PVC (3-4″) to it. Then, glue a union to this short piece. Using a union here makes it easy to disconnect your drain hoses if you need to move the tank. Keep in mind that this will be semi-permanent, and the only way to actually remove the bulkhead will be to saw through the short length of PVC. It’s a good idea to test your system for any leaks by filling it with tap water then turning the return pump on. Before this, You can use an air compressor to blast air through the pipes to get rid of most of the shavings or sawdust that might be in there. Observe the system again after a few hours to confirm all glued and threaded connections are secure and leak-free. You should also shut off the return pump to test the overflow and that you have enough sump capacity. With the return pump off, you can also mark the high-water point in the return pump sump chamber to tell you what the max-water level should be. Doing a leak test helps flush out the system before you add your rock, fish and sand.